Lovely traditional Ibizan style villa, located in the heart of Las Salinas, in a small residential area located on a small hill just 1km from the famous beaches of Las Salinas and Es Cavallet, which can be accessed after a nice walk among the salt lakes. Room, Ground level. This bedroom has 1 double bed. Bathroom ensuite, With shower. Room, Ground level. This bedroom has 1 double bed. Bathroom ensuite, With shower. This bedroom includes also TV. Room, Lower floor, direct access to the terrace. This bedroom has 1 double bed. Bathroom ensuite, With shower. Thanks to its unique strategic location, the villa is the ideal place for those seeking the privacy of a self catered villa without sacrificing the hectic city life. Everything with beautiful views over the salinas and the sea. Ibiza town is just a short 7 minute drive. Supermarket, bus stop to Ibiza and restaurants just 1km away. - Guests are requested to drop off their garbage in the containers provided for this purpose when they leave the house. The road service does not exist in Ibiza. - In low and mid season, a fee may apply for consumption of heat and electricity better than average. - The house must be returned in the same condition of check in. Otherwise fees can be charged to the customer. - 2nd payment 50 Days to arrival day : 60 % of total amount of reservation is due to Villanovo. - Advance payments can be made with the following payment method : Visa - Mastercard - Carte Bleue - Bank transfer. - On site payment can be made with the following payment method : Visa - Mastercard - Carte Bleue - Cash. - The reservation price does not include optional incidentals or on-request items which will be added to your final bill. - For all cancellations, the initial guarantee deposit is non-refundable. - Cancellation occurs less than 50 Days to arrival day : 100 % of total amount of reservation is due to Villanovo. Marc war sehr zuvorkommend und kompetent. Das Hauskonzept, die Aufteilung im Haus sowie der Garten. Qualität von Bett, Bettwäsche und Handtücher sowie deren Farbe. Man bekommt leider nicht das Gefühl von top Hygiene auch wenn alles sauber war. Im Haus herrscht überall (auch im Nebenhaus) feuchte Luft und es riecht nicht gut. Die Kochutensilien wie Pfannen, Kaffeemaschinen etc. sind veraltet und sollten ersetzt werden. Küche ist zwar gut eingerichtet aber macht keinen wirklich sauberen Eindruck. Location. It was quiet and peaceful. The shop at the bottom of the hill was very useful. The local beaches/beach clubs were fantastic. Pool. The children loved the pool .... and so did the adults! Air conditioning. The air conditioning in both of the bedrooms of the main villa were broken. These should be repaired and made available to guests. Even with the fans provided, the rooms were un-bearably hot! The cats. The cats constantly begged for food and tried to steal food from our plates when we were not looking. They were constantly trying to get into the villa through the windows/doors. They should not be encouraged to stay around the villa. The electricity in the house was not functional for the first two days (it kept tripping out if you tried to use the cooker, kettle or washing machine), which made it very difficult to look after our children. The villa should not have been offered for rent with the electricity in this condition. VILLANOVO is a team of villa specialists and a fully bonded travel agency specializing in upscale rental of luxury villas, charming houses and luxury homes for an unforgettable holiday. 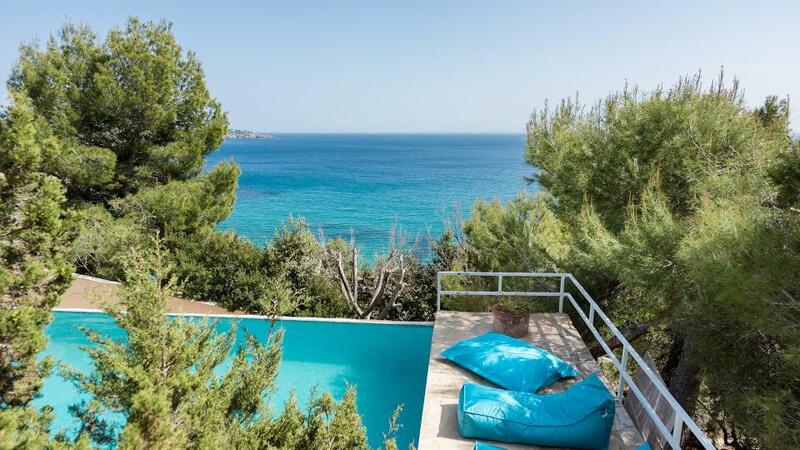 Villanovo owns the Villanovo, 1001 Villas and Ibiza House Renting trademarks. We are fully financially bonded and bound by professional codes of conduct, complying with the latest European directives. Your money is "safe" and your rights protected with a reputable and professional holiday company. Villanovo is a member of APST. Villanovo holds a fully bonded licence granted by Atout France.